This week was a slow one, been fighting off the flu and it finally got me, so I have been taking it easy and today was a couch day, hopefully that means it is on it's way out. I was able to finish my blocks from Cheri's Facebook Group. These are fun to do and work up quickly and she still has all the blocks and instructions in the files, so you can still get in on the fun. 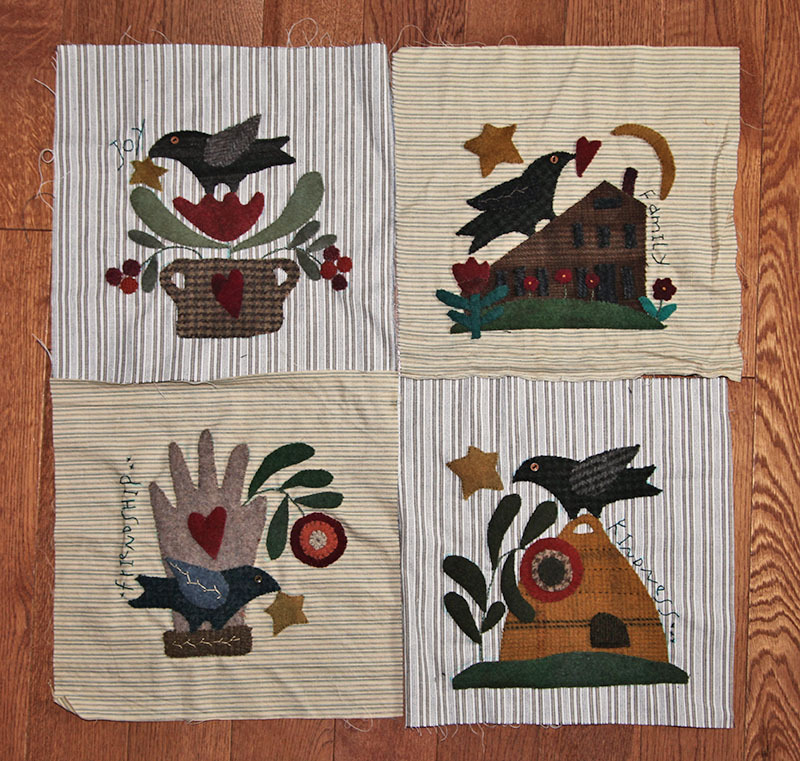 I oversized mine since the cloth is thin, next I will cut them down to size and add the sashing and work on the log cabins to go with them, a great way to use up scraps. We went to pick out our prize and there were no baskets left, was hoping to get a nice gift basket, but there were other prizes available. Some were just not my style and then she looked up and said, oh and this beach window. 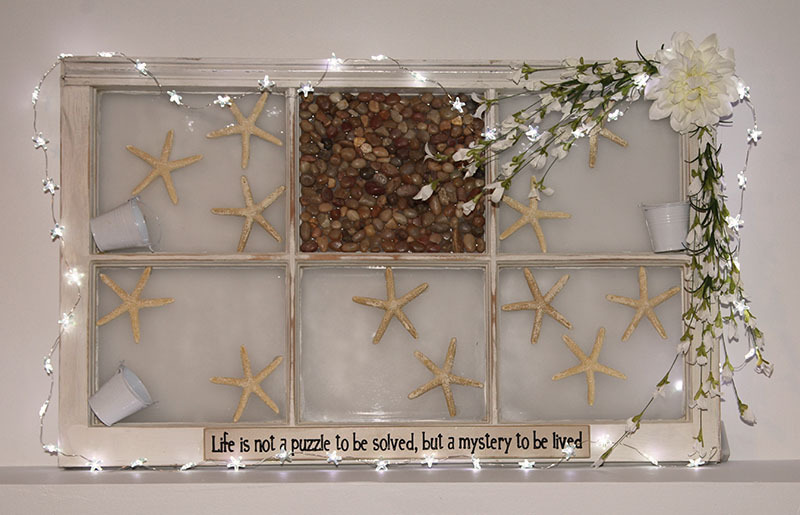 Well, that was fate, the perfect piece to put in the beach room. A bit shabby chic, and thinking I may put an ocean print behind it, or I can just paint a simple ocean and sky? It is on the wall shelve for now, not sure if i want to hang it, it does have a heavy chain on it, but I like that space and I can decorate around it. I also have a double oar to hang on the wall above it. I like how my starfish lights look, around it. The saying is perfect for my room. I hope everyone has a nice weekend, we have rain, so maybe another rest day and hopefully some sun and a walk on Sunday. 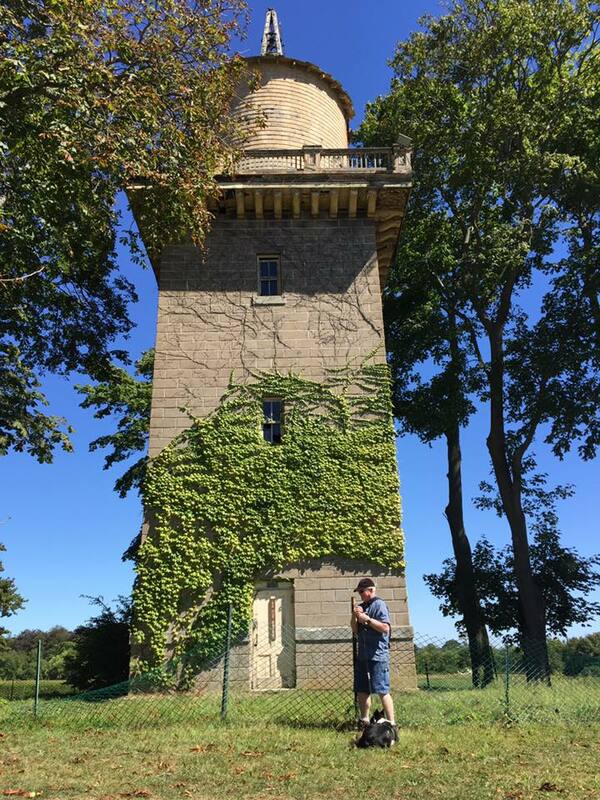 This weekend we did a little exploring. 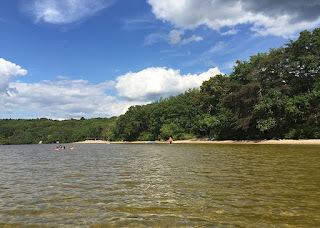 On Saturday we went to Connecticut to Hurd State Park. It is a large park with an adjoining park next to it, so a lot of area to explore on the Ct. river. 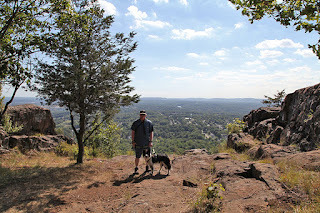 We only did a short hike, about 3 miles but a lot of uphill, so I got a good workout. Or course Bean loved this park, the minute he saw water as we walked down the trail, he got more determined to pull that way. We let him have some water time before we started our hike. This area is a picnic area, so lots of grassy open spaces on the river. 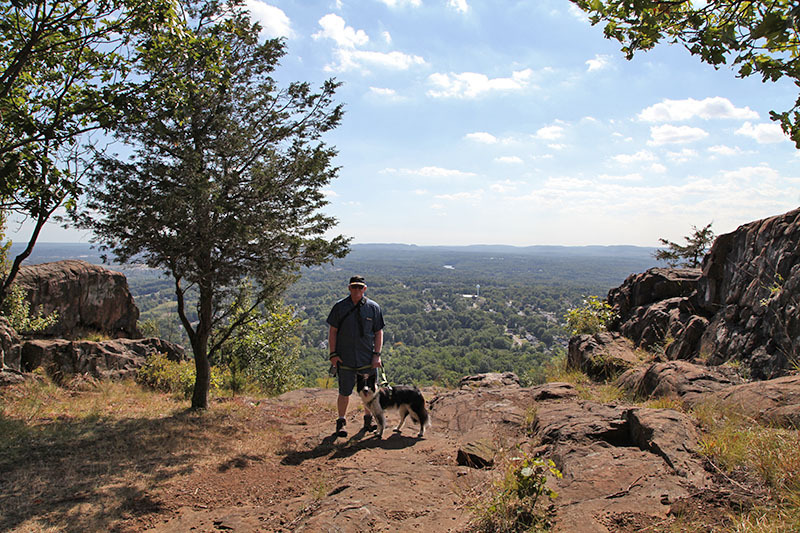 We climbed up the hill to the rocky ledges, beautiful views of the river. 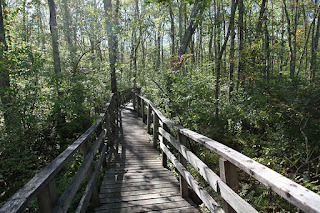 On the way up, we noticed another park, so we stopped at Machimoodus State park which is just down the road. 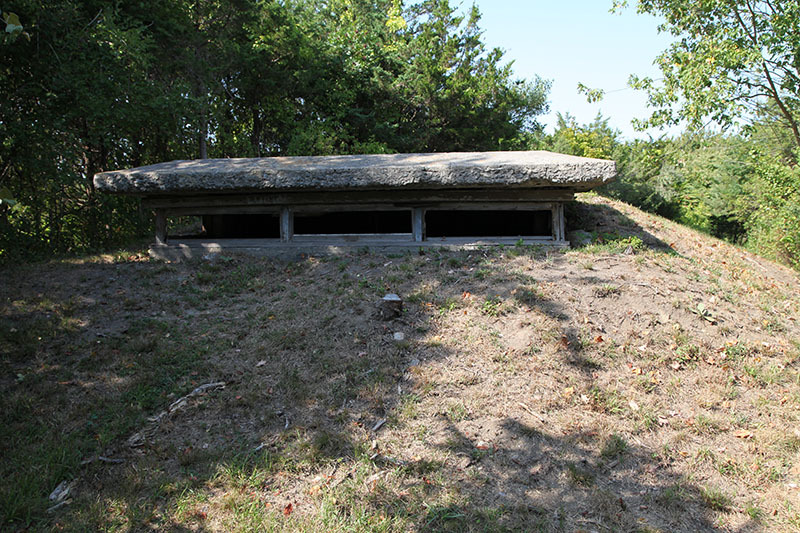 I looked it up on the internet and saw that it is supposedly haunted, but no weird noises while we hiked, lol. I found it peaceful and with another hike up, over 2 miles total, we got to enjoy views of the Salmon River. You can read more about the park and the legend at Road Trippers. On Sunday we went apple picking. I used the older apples to make apple crisp and got a fresh bag since I love eating them for a snack. 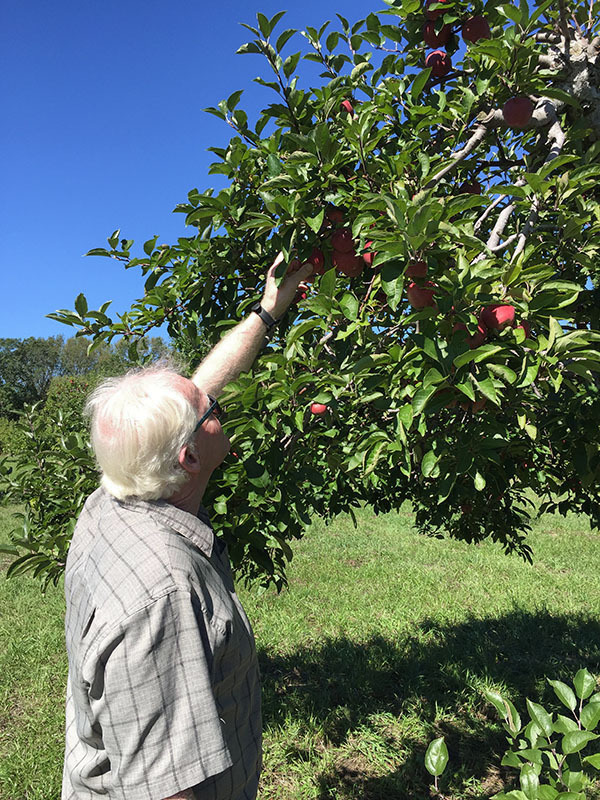 It was crowded and it seems everyone was picking from the bottom of the trees, so I had to have Bill's help to get the apples up top. On the way back we stopped at the Bee's Buzz. I didn't find any goodies this time but they were having a raffle and I made Bill fill one out, well, he won a basket. They said to come in and it is first come, first pick, so hopefully there is something good in the ones they have left. We passed a park on the way up and it is an Audubon sanctuary, so no dogs. We left Bean home this time so we decided to check it out. 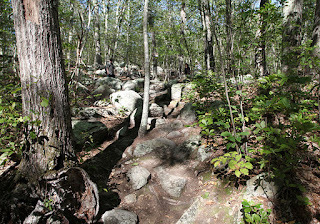 It was another uphill climb and this one was rocky and full of roots, and I wasn't wearing my hiking boots, so we took it slowly. I didn't want to go to far, but I saw photos of waterfalls. We got to the stream which was dry and I had a feeling there wouldn't be water with our drought season, but up ahead it looked like some interesting rocks and I love rocks. It wasn't just rocks, it was cairns. The sign said there are over 100 of them in that area, and they are not sure how or why they are there. On the way back I wanted to take a photo of Bill on the bridge. When I got home I looked up the park and they said it is haunted and have gotten high readings in the area. Well, I didn't see any ghosts but when I looked at my photos, I noticed a strange foggy mist at the top of the photo and in that is a blue orb. What do you think, haunted or not? Another fun thing I enjoyed this weekend was time with the boys. The baby is still leery of me but Nick was ready to explore the house with me and look for the kitties. They went out to do some shopping so Nick and I took Bean out for some play. He is disappointed that the tractor is broken, he loves it when Grandpa gives him a ride. I hope everyone had a fun weekend. This week will be more rain on and off, so I am working on my blocks for Cheri's free BOM. Well, just one thing this week. I seem to have lost a day, lol. One moment it as tuesday and the next thing I knew, it is friday, thought I had one more day to work on some blocks. I finished the newest block from Buttermilk Basin and have Cheri's blocks started, so hopefully I can finish sewing those this weekend and get the pieced blocks made up next week and be all caught up. 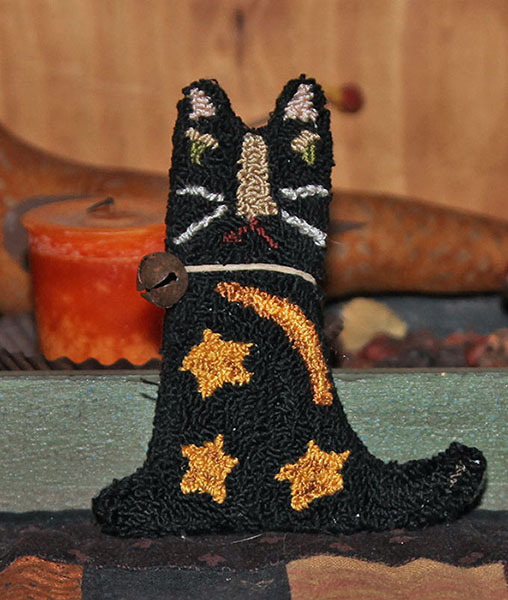 Did you know Cheri offers free patterns on her Facebook page? 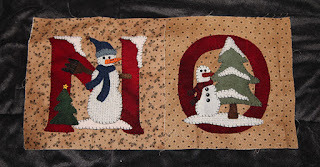 She just uploaded another from her Christmas book, a nativity pillow and a christmas quilt. 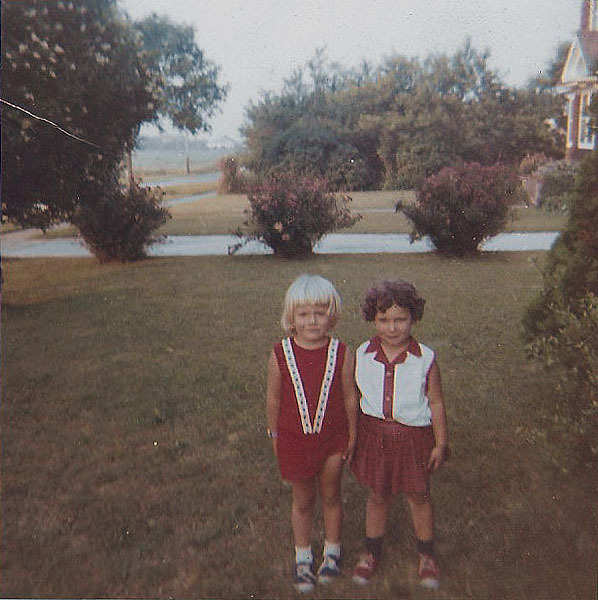 I found a few old photos in my slide box, this one is me and a girl named Amy Sherman. 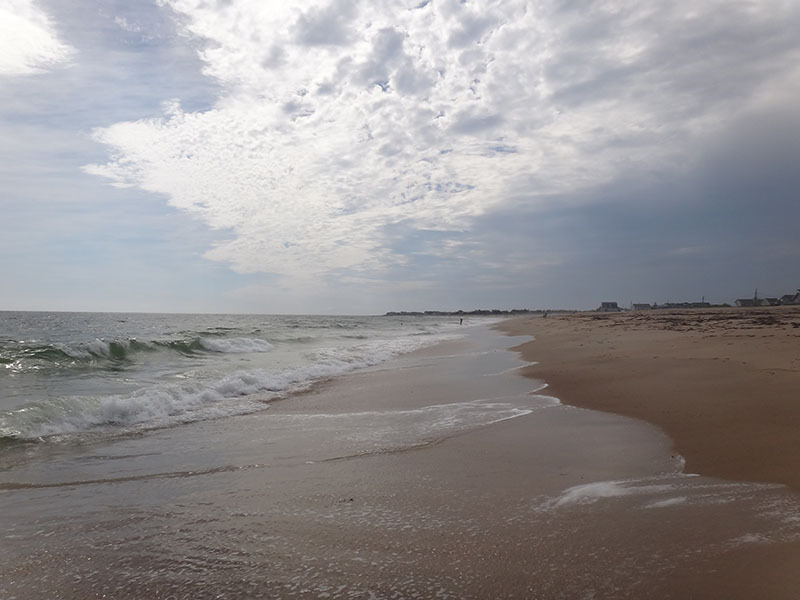 I spent my summers with my grandmother in Amagansett, Long Island. She would make me new dresses and I have a feeling she bought me new sneakers since they match Amy's. We got hand me downs and I was the youngest of 6 girls, and shoes were worn as long as she could squeeze our feet in them, lol. 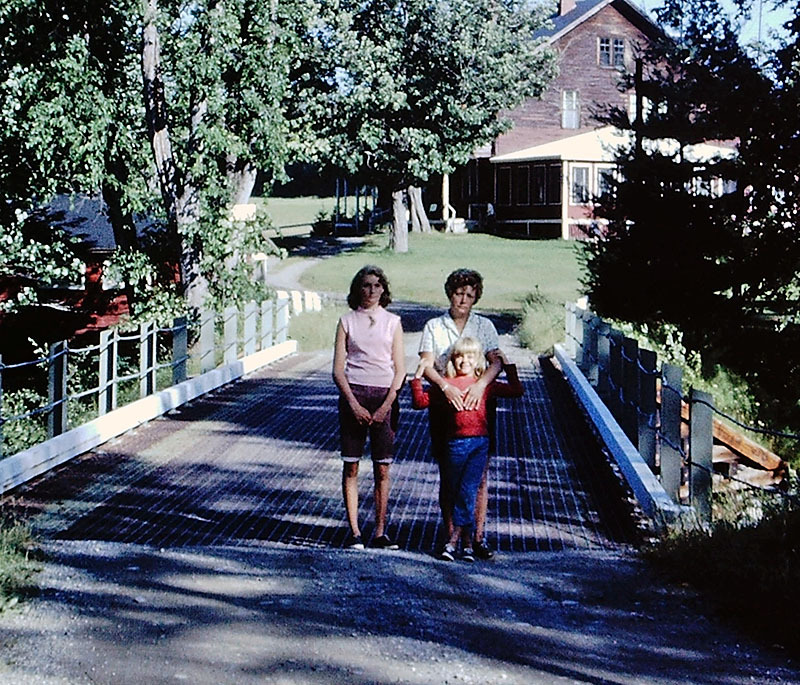 In those days, I could walk around the neighborhood and up to the store, now it is a highway and big houses with pools. I finally got the newest blocks done and some embellishments, I am thinking this will be a wall hanging so I am adding bells and buttons to make it fun. 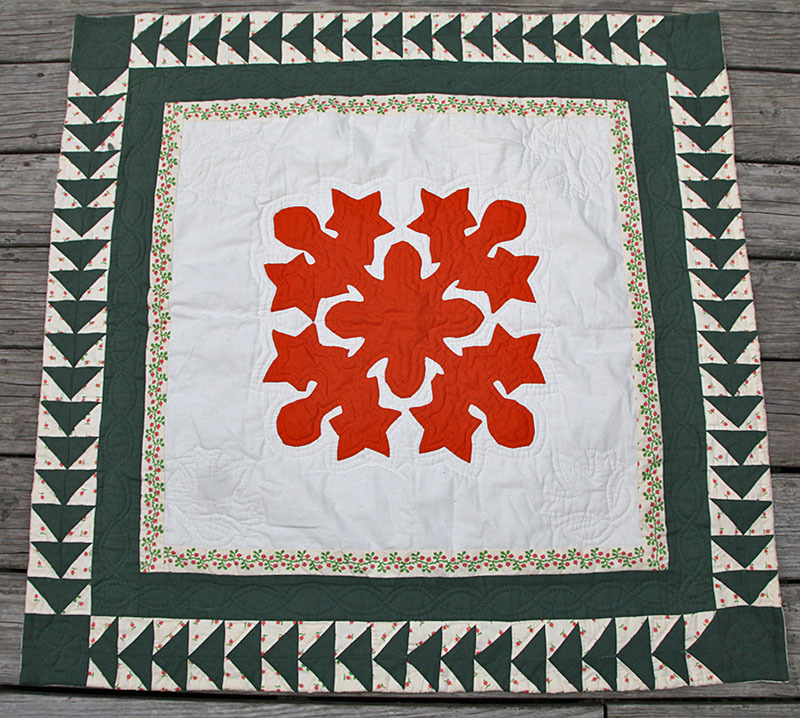 The hard part will be quilting it, but the good thing is I have my new machine and it will be able to quilt around any bumps. 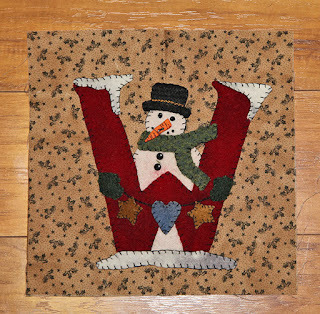 I love this BOM, it is from Stacy of Buttermilk Basin. There are two more blocks, the W and the longer side piece, can't wait to see what is coming this month. Stacy is at a show so it should be coming soon. I will also have to start going through my stash to see what I will use on the sashing. This weekend was the end of Bill's vacation. 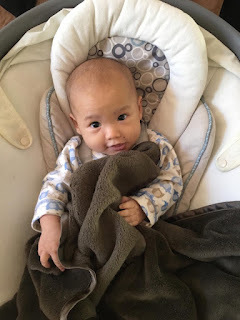 Saturday we had plans to visit the kids, then they changed it to visiting us and having dinner at our house so we had a cookout, they ate, Ivy fell asleep, the baby cried when I held him and then Nick finally warmed back up to me and we had some fun time together. 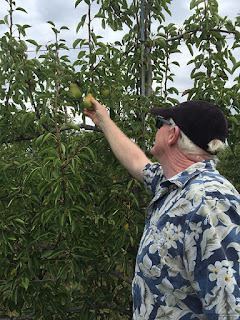 I am hoping we can get Nick next weekend, maybe take him apple picking, he loves that. On Sunday we had no plans, a storm was coming so we went shopping and bought our suits. It hadn't rained and I decided to go to the beach and just enjoy the fresh air. Bill went swimming and I just relaxed. We also got a show when hundreds of migrating starlings flew around the area in formations. 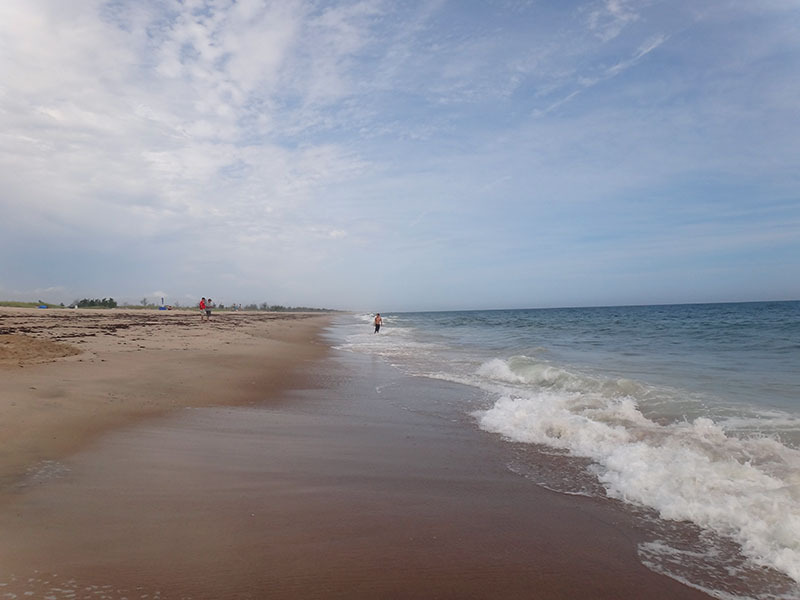 Here is one side of the beach, only a few people, best time to go to the beach. Blue skies and sun. Here is the right side of the beach, cloudy and ominous. We spent a few hours at the beach and not a drop of rain, but behind us the storm had come in and rained at home, so the beach was the place to be. I hope you all had a wonderful weekend. This week I am hoping to get Cheri's Blocks made, another fun quilt with wool. 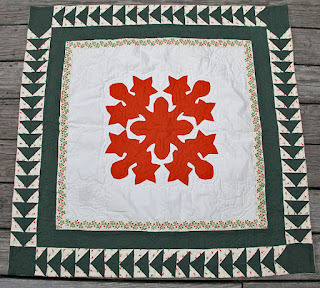 You can get her blocks on her Facebook group, Quilts by Cheri. I am sure a lot of you go through the same thing, wether you stay home or go away, we seem to need a vacation from a vacation;) This week was no difference, I think I am officially exhausted, but then again, tomorrow is another day and one more nice day before the rain comes in on Sunday. 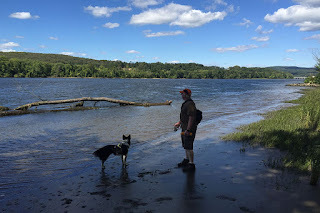 Tuesday I decided to go for a ride up the Connecticut river and if we had time, over to Graig Castle in Meriden Ct. We went along the coast to save time and then up a scenic road to enjoy the views and towns along the river. 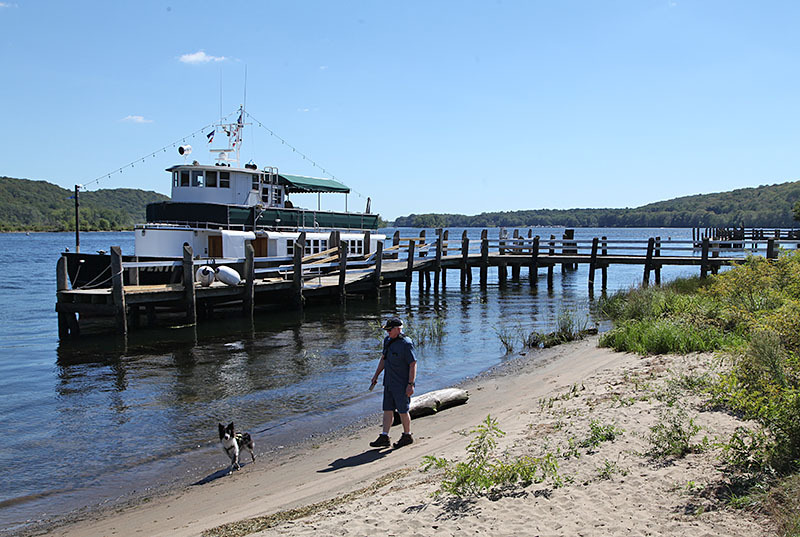 Our final stop before we headed across to Meriden was Eagle Landing to take a break and give Bean some play time. 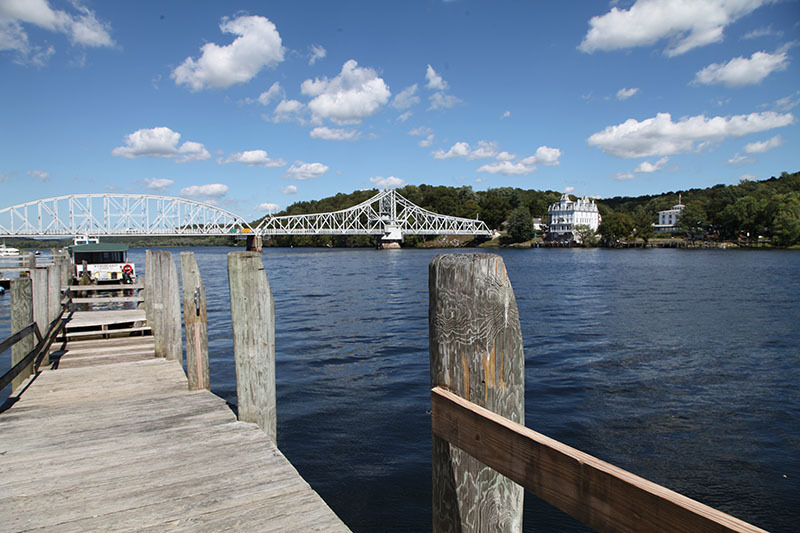 I love the views from this side of the river, and a large park to walk around with access to the shore. On the other side, a view of the swing bridge and opera house. We finally got to Castle Graig, it is 976 feet high and the tower is 32 feet, so you can see for miles in all directions, in Connecticut. We walked a bit on the trails that followed the cliffs, great views from every point. 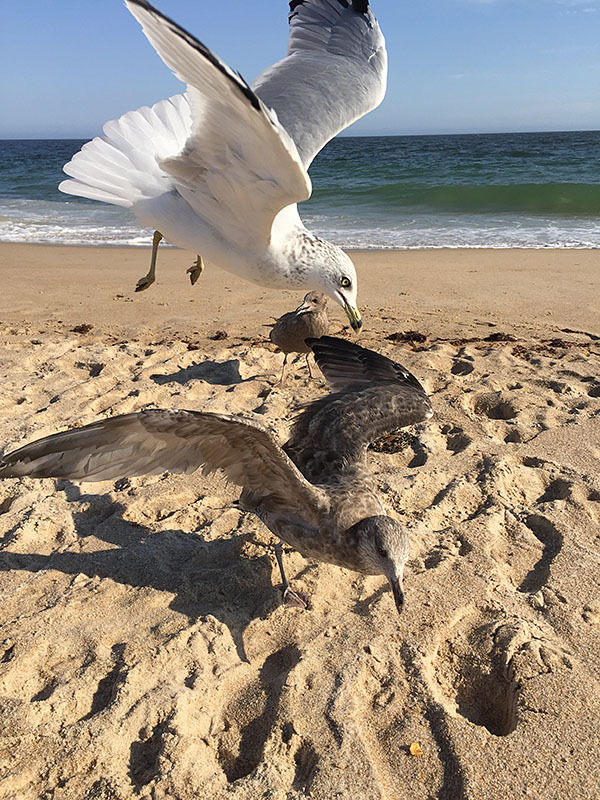 One way to amuse myself was to throw corn chips and watch the seagulls fight over them. The bad thing is, you end up with way too many feathered friends and half of them are flying over your head, luckily no accidents happened. 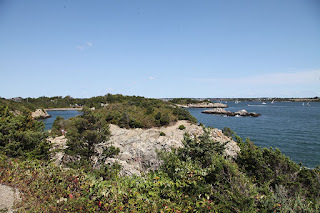 Thursday I decided I was going to brave a long drive and traffic and go to Woods Hole Massachusetts. We went through Newport and I picked back roads so it wasn't too bad until we had to connect with highways to get back on a back road. 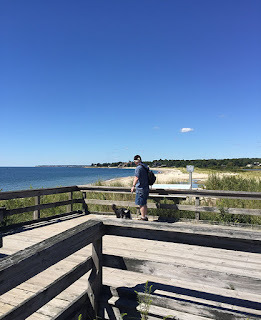 I have been going all day and night and no time to really plan a day, so we just go and see what we can see, but I could not find anything once we got to Woods Hole and there was no parking and no beaches that weren't private and I just gave up and headed back up the coast. 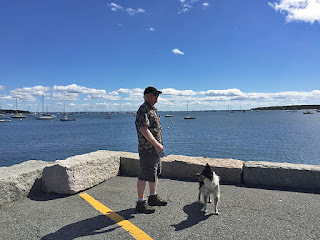 We did find a wonderful town on the way down, called Mattapoisett. 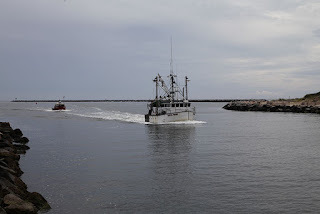 There are a lot of small towns and seaports all along the coast, so maybe we will visit some another time and explore the areas. We enjoyed views of the islands off of the coast and Bean got a treat from the Harbor Master, who wanted to pet him and give him a biscuit. After we left Woods Hole we looked for a place to stop and relax. I had my phone map and each park I saw, was either private or impossible to get to. 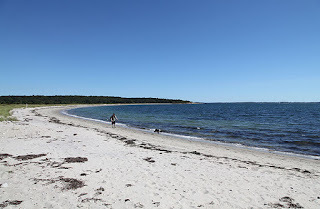 We finally found the perfect beach in West Falmouth called Old Silver Beach. 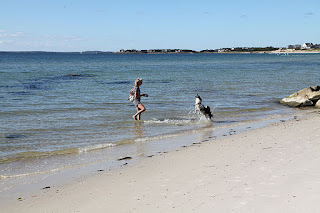 Lots of sandy beach and shallow water, so Bean and I got to have some play time together. 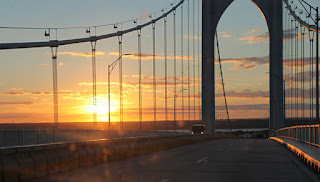 The rest of the ride home was traffic, since we were hitting the shift changes and everyone trying to get home or out of the area so by the time we got to RI, the sun was setting and no where to park for a nice view and too late to head to the lighthouse. 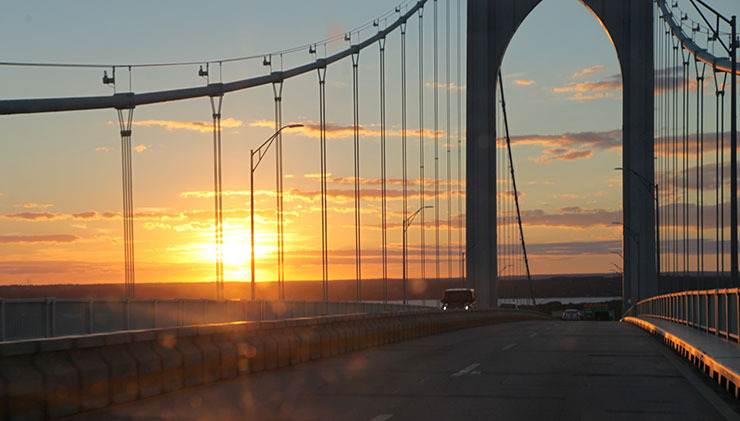 We caught a nice view as we crossed the Newport Bridge, minus the dirty window. 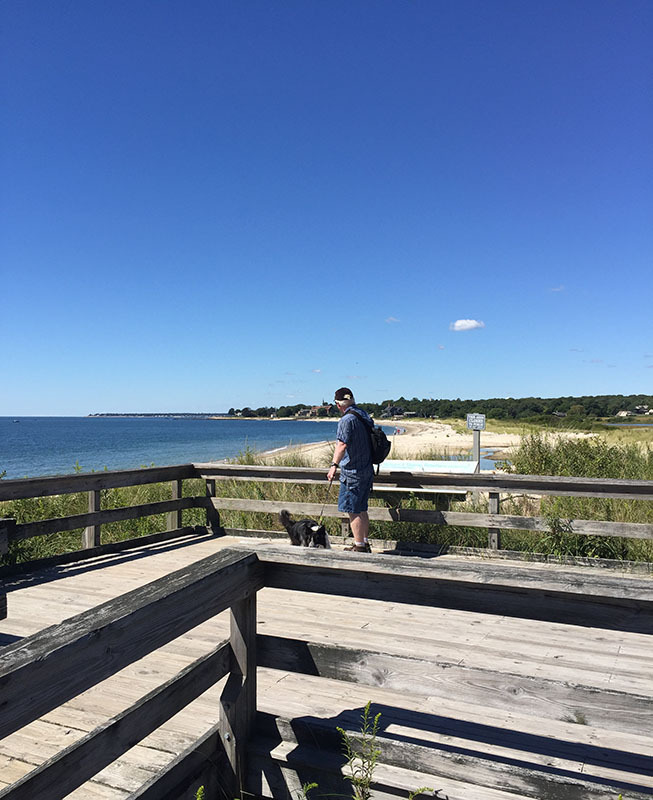 Today was a rest day, I wanted to stay closer to home and just enjoy some beach time and a hike. Yes that is rest to me, lol. 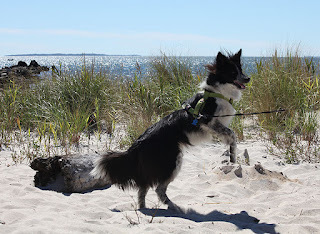 But, we ended up walking the entire length of the beach, the regular walk around the trails and added on a new trail, so we hiked over 7 miles, way too much for me and now I am ready to crash. Today my son sent a photo of Alex, they made it home safely, so we will probably be visiting them tomorrow. 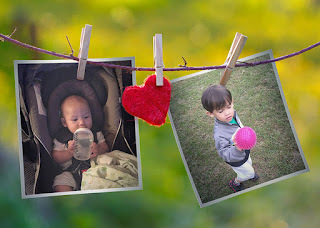 Can't wait to give my sweet grand boys some hugs and love. I hope everyone has a wonderful weekend. Bill has this week off, since he worked straight for three weeks, he needed a break. So what to do, run him ragged driving me around to my adventures, lol. 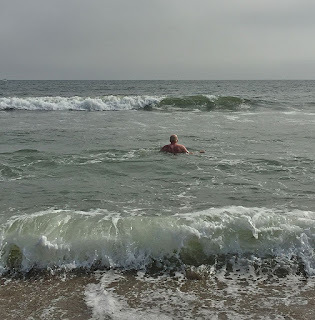 We started Saturday with hemming and hawing on what to do and finally decided to go to the beach for an ocean swim. It was a bit cooler and the fog was rolling in but it was nice to get out for a bit, and the waves were picking up. 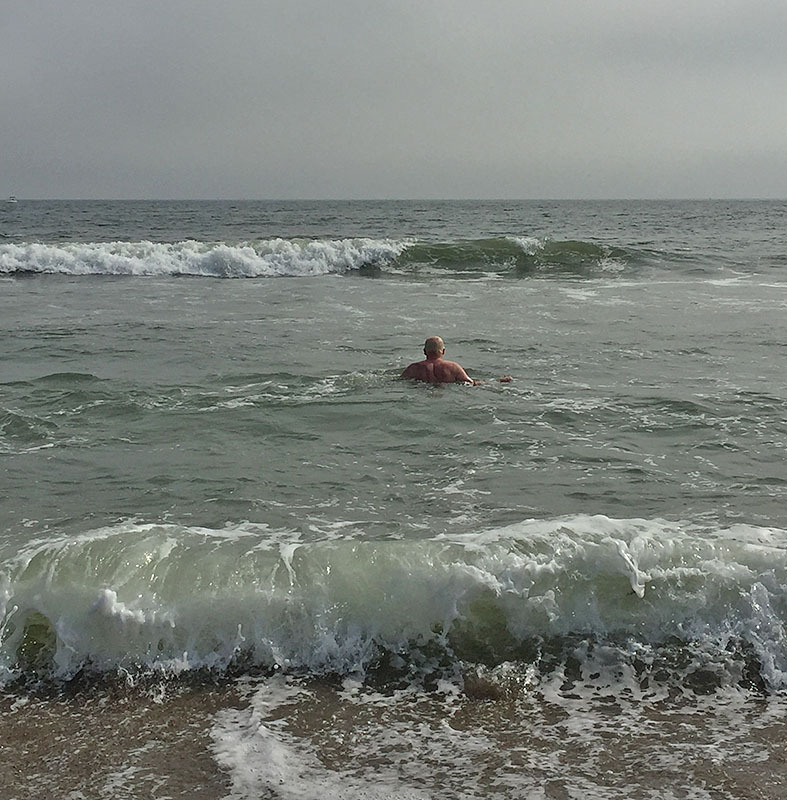 Bill went out for a bit and played in the waves, then I went out and the waves got bigger. The area starts out shallow, then drops deep, then shallow again. I spent the time trying to get out the to second shallows while the waves kept pushing me back. I woke up sore today, it is definitely a good workout. 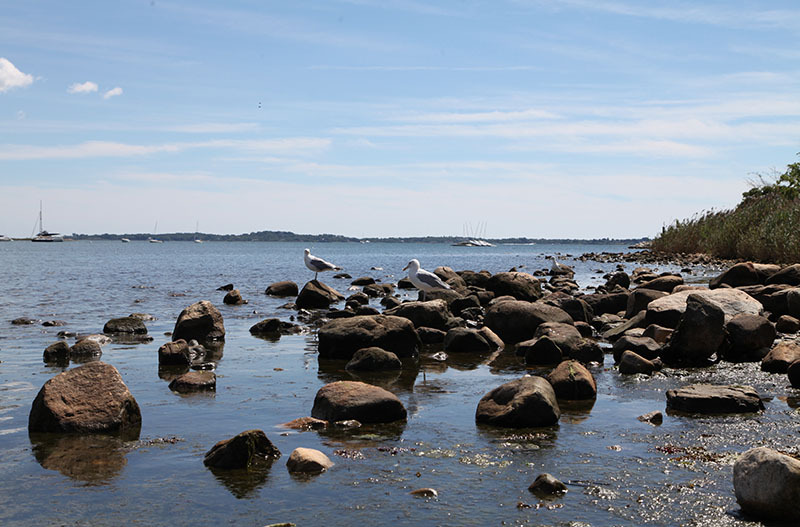 Sunday was the same thing, was tired from the beach but I wanted to get out so we decided to go to Jamestown for a stroll around the cliffs. 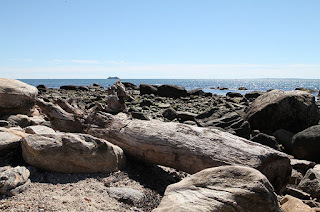 It was a beautiful day and the tides were coming in and crashing on the rocks, a peaceful place to walk around and just enjoy the fresh ocean air. Of course I had to find a hidden path that led to a rocky crevice and an island, so more climbing and exploring. Today was our first planned day. 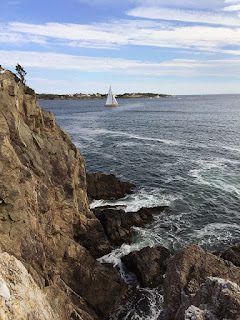 We headed to Connecticut to visit a few places along the ocean. 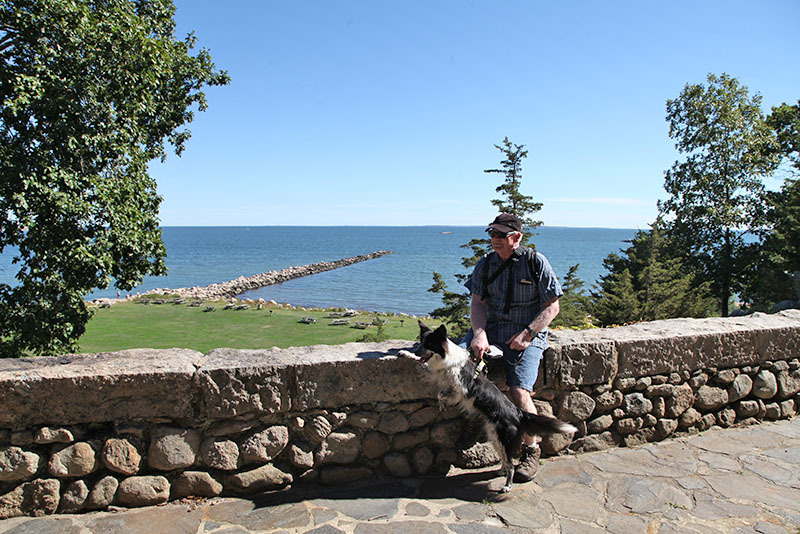 The first was Harkness State Park. 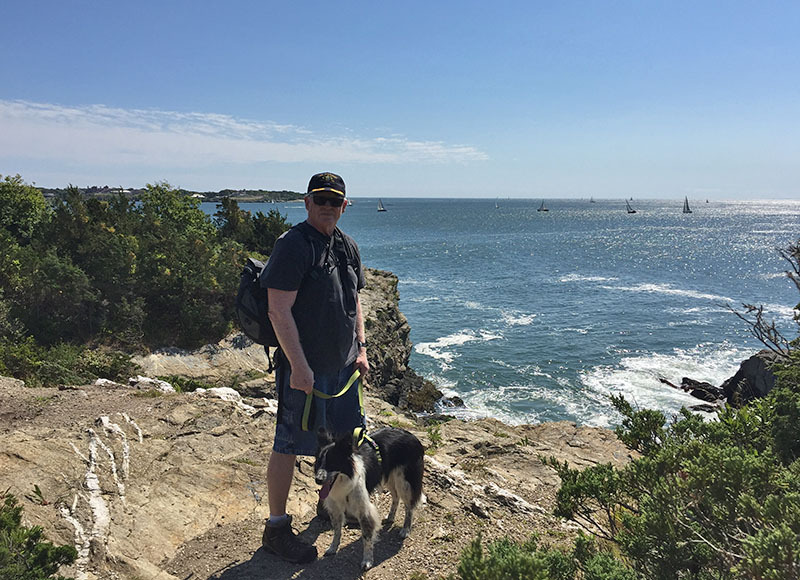 We headed up a broad walk to the beach and enjoyed the views. No swimming at this beach, so we strolled along the beach to the rocks at the point. The New London ferry was coming out of the Thames River to Long Island. A trip I took every summer to stay with my grandmother. 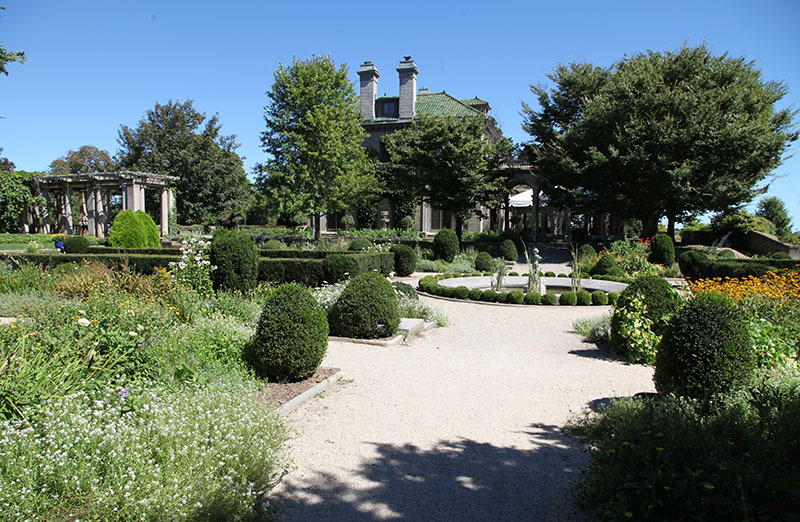 Above the point is the original home of the Harkness family, a Mansion with beautiful gardens. It is open to walk around, and they do tours of the inside of the home. We walked around the area and found this fun tower. It is definitely worth a visit. The next stop was a place I found last minute and had to take a look. 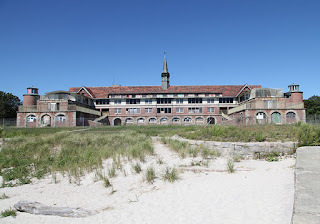 It is Seaside Sanatorium that was built as a hospital for children with tuberculosis, then a nursing home and then an institution for the mentally ill and that is when it went downhill and they closed it down. They say it is haunted and now it is run down and the grounds are open as a park. No swimming now but it is a beautiful area to walk around and Bean enjoyed being able to play a bit. 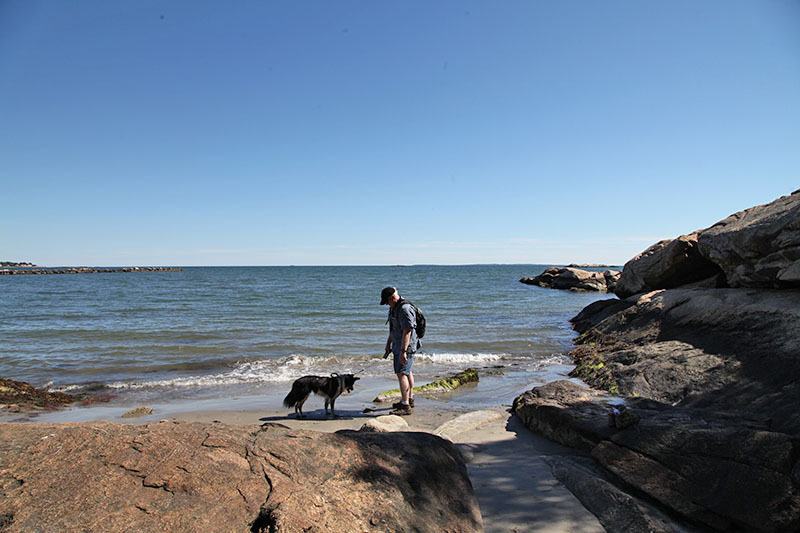 The next stop was our main stop, Rocky Neck State park. 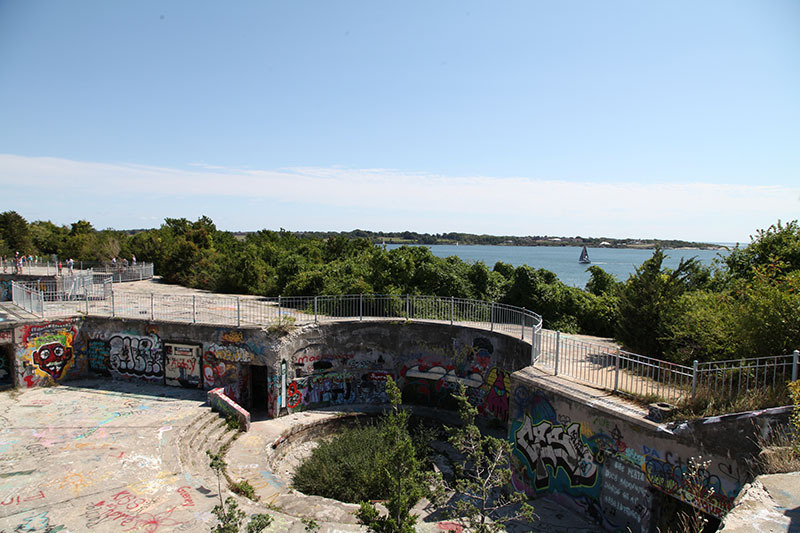 It is separated from the beach by a train track, so you go under the tunnel to get in from the parking lot. 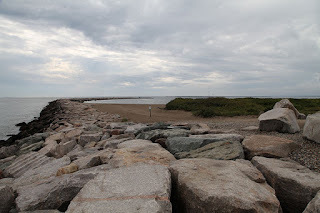 We walked outside the beach area to the picnic area and along the rocks. We found a hidden cove with a beautiful sandy spot for Bean to play at. Wish I had bought our suits, it was warmer there and the water was nice, at least I got to cool down a bit. 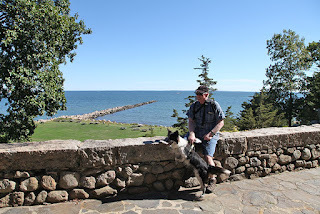 There is also a large pavillion so we walked up the rocks and along the porch. Of course I saw a sign on the other side that said, no dogs allowed in the pavilion, oops. 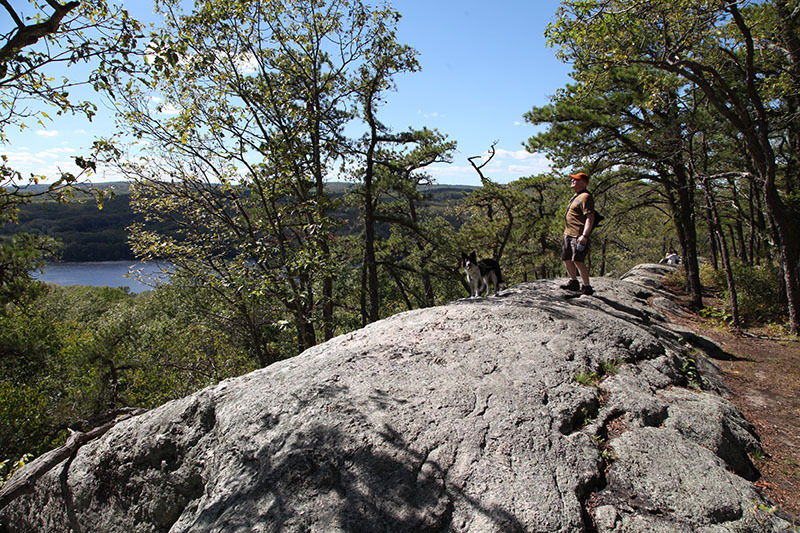 Higher up above the picnic area and beautiful views of the Long Island Sound. I did two so far and one more to go, and I still have embellishments to do. 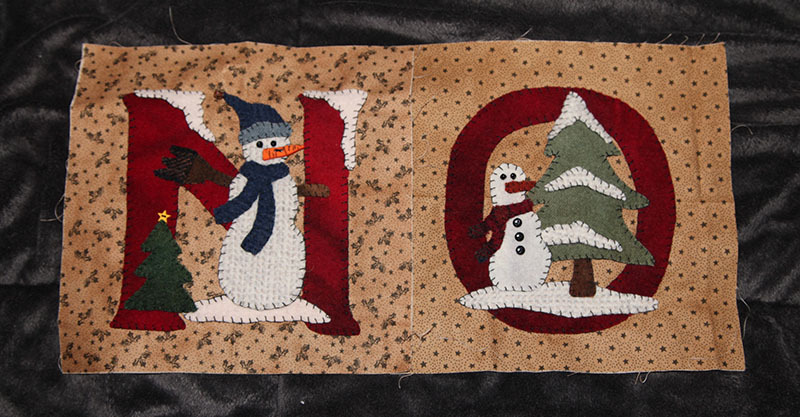 I really love this BOM and it will be a fun piece for Christmas. 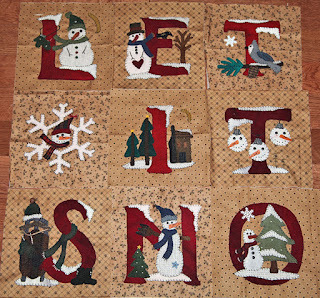 I still have the S to do, that has a sled and lots of little pieces, so I saved that for last. Next will be the W and a long side piece, can't wait to finish these and just in time for the next one. One of the things that is keeping me busy this week is slides. I got a smaller slide viewer that loads right into my computer, so I can view the slides and just take the ones I want. There were a lot of old slides and most were from trips, so scenery and ones my brother took when he was in the navy, but I finally got through that batch and got some fun ones. I need to learn how to do them into photos if I can and my nephew said he can try some, he does graphics, so he may be able to do it better than I could. 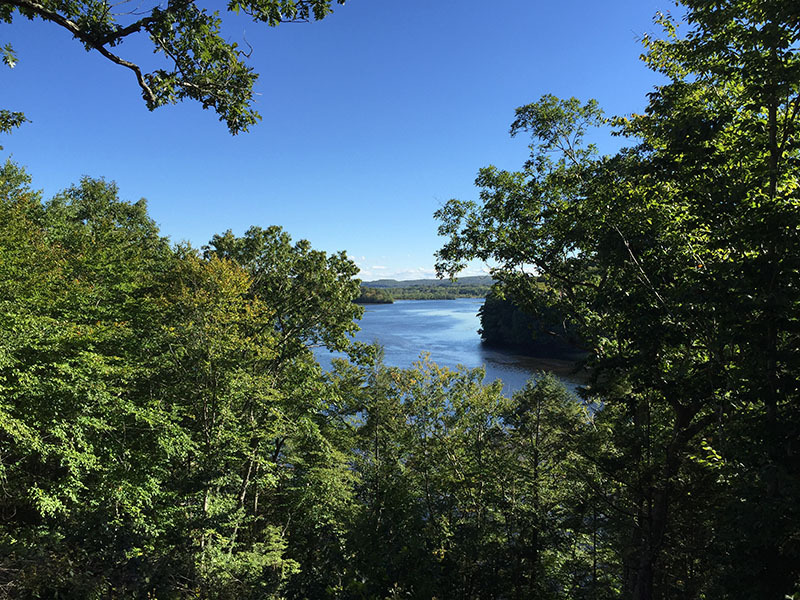 This is one from a camping trip to Maine. I am pretty sure it is on Sebec lake, they had a camp then, now it is just house rentals. I loved going there and one year Bill and I drove up there, but it was not the same. A lot of good memories, camping with my family. 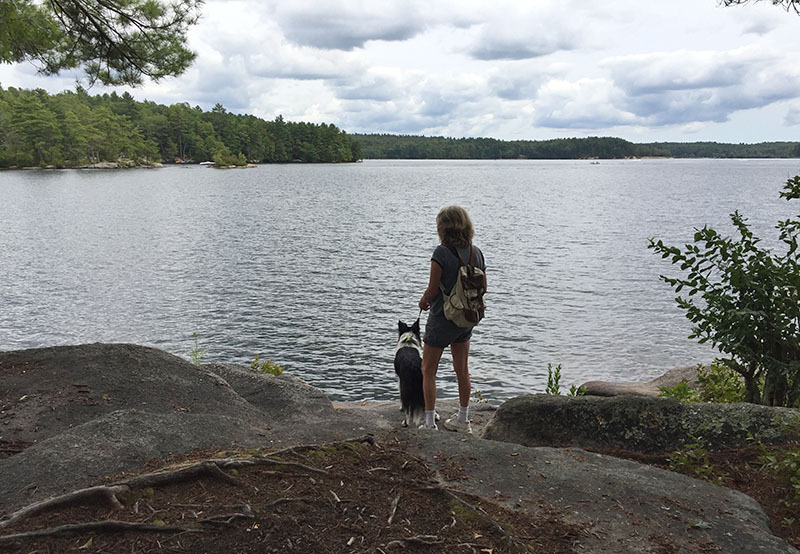 This week Bill has off, so we may just stay home, I have some places I want to visit and if I change my mind, we can always go camping for a few days later in the week. I hope everyone has a wonderful weekend. This is my mom and me and one of my twin sisters, they look alike at some ages. Bill had two extra days off so a nice long weekend. We made the best of it by enjoying our own area and were able to get out and enjoy a few good days before the storm hit. The weather is not bad here, but the winds were whipping up the waves and making it hard to swim at the ocean beaches. Today we got the winds and a little rain, hopefully we will get more rain before the warm weather comes back. 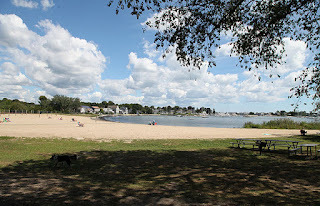 Saturday we decided to go to Connecticut and check out a boat launch we could never find, which I finally figured out. You drive over the border and go into Connecticut and then down a long back road and back towards Rhode Island and there is a nice big boat launch at their end of the lake. Since we had never been and I wanted to walk a bit, we walked along the path that follows the shoreline. The path goes back to Rhode Island but we were just exploring. It was a beautiful part of the trail, lots of areas to stop and enjoy the views. From this viewpoint I saw some little islands and people swimming, so we walked to that point and checked it out and went back to get our suits on and our kayaks. It was funny, Bean and I were waiting for slow poke Bill and Bean started whining and hopping into the kayaks, I guess he has decided he likes kayaking. 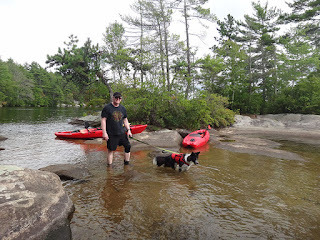 I also think he knows, kayaking means water fun and we had our own little spot on the island to relax and go for a swim. After our swim, we did a little more paddling and enjoyed the shoreline, love the rock ledges in this area. On Sunday we wanted to see the ocean and watch the waves from the storm that was approaching. We went to Fort Wetherill which has views of the bay entrance and ocean and on the other side is Newport. 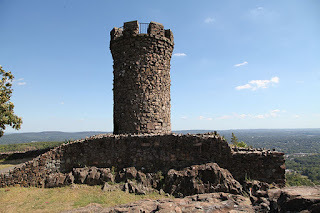 This fort still has a lot of structures still standing, so we could walk around some areas and on the tops to enjoy the views. 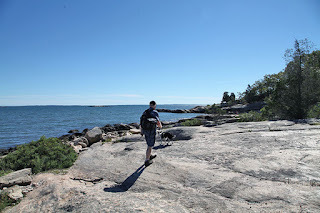 We then took a path that led to the ocean cliffs, spectacular views of the outer bay and the sailboats. We continued along the paths and came out on the Newport side, beautiful views from every angle. We left the fort and headed to Battery Park. 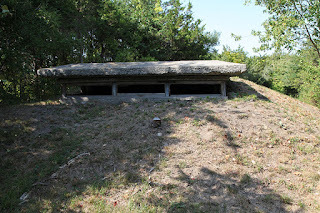 I found it on a map and wanted to check it out. 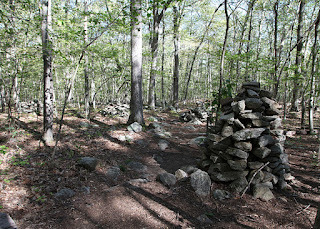 A nice walk through the woods to an area that was once used in the American revolution and then for the world wars. 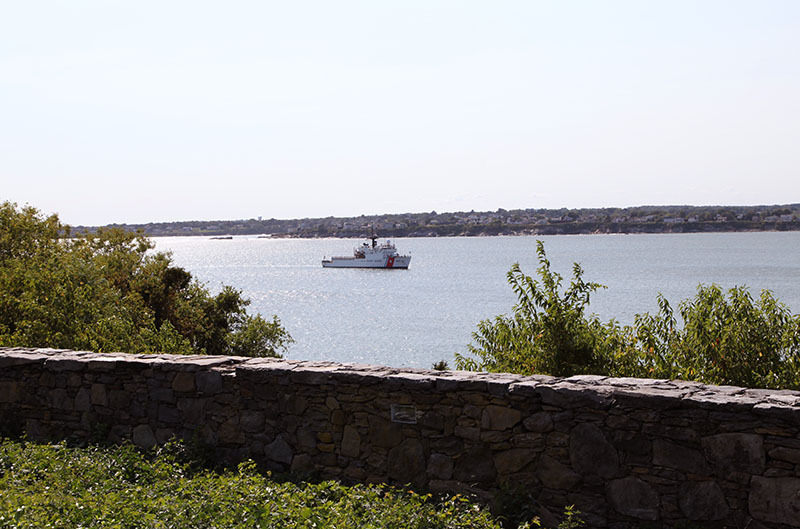 There is not a lot left, but it was fun to visit and we even spotted the coast guard boat, anchored in the harbor. On the path back we came across the fire control stations. I cannot imagine being stuck in that hole, looking out through the slats, all day and night. 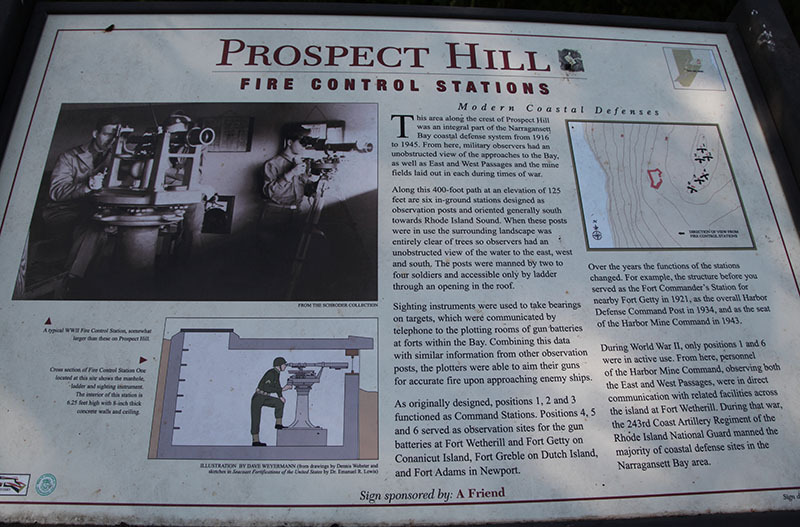 Here is the sign that was posted nearby, it shows what it was like and a bit of history about them. And today we spent the morning, cleaning out the yard and removing projectiles, just in case. 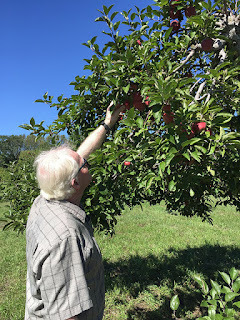 I noticed that is was nicer in Connecticut and the orchards were open, so we headed back over the border to go apple picking. 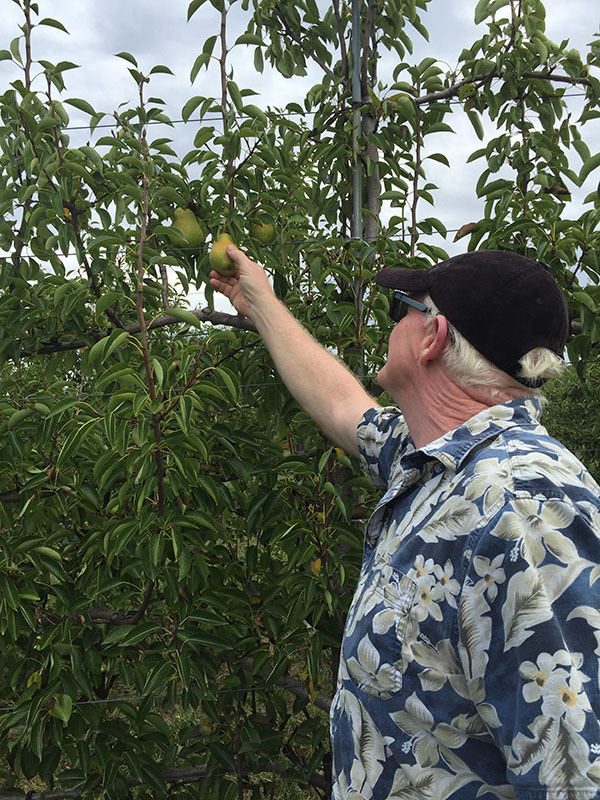 Not only did we get some fresh apples, but some pears, as well. I hope everyone had a wonderful weekend and not effected too badly with the storm. If you are bored and want to see the little slide show I made up, you can watch it at My Youtube Channel. Bill decided to take a few days off this week, since next another guy is going on vacation, so we were able to get out a bit and enjoy the beaches without the crowds. 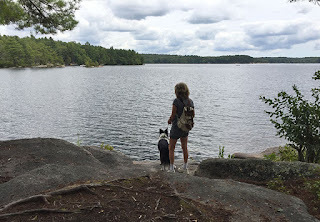 I kept it a bit low key for me, I still have to watch my back and I do tire easy with the lyme, but it is worth it, to get out and do something different. Yesterday it was raining most of the day, but I checked the weather map and saw a break in the storm, so we heading south and hit a store that has a lot of nautical items. I found two sets of hooks that I liked, so I got both and one is too small and one a bit large for the space to hang my oars, so I think we will just make some. But they are nice, and I can use them in the room or in my bathroom. 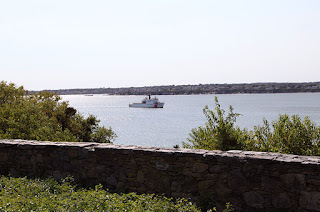 After that we went to Galilee and watched some of the boats coming in. Usually the lot is full but there was plenty of room to park and the rain was stopping so we could enjoy some fresh ocean air. We headed up to the lighthouse and noticed the fishing park was open again. It has been closed since the storm since all the rocks were carried into the lot and it was a mess. It took a long time with back hoes and replacing the rocks and building up the shoreline, but the area is open and my favorite spot to get out and walk on the breakers. 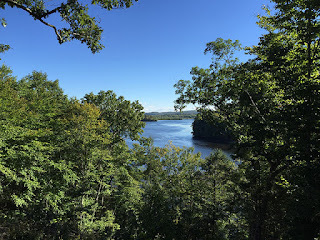 Today it was a beautiful day for a ride to Connecticut. I wanted to check out a dog beach in the city of Noank, called Esker Beach. We had to go down some back roads but the area is full of old homes and churches, so it was fun exploring. The beach was nice but it was low tide and it stunk so bad, I could not stand it for too long, lol. The beach was also full of seaweed and I saw a lion's mane jelly fish laying on the sand, no thank you. It was a nice place to get out and enjoy for a bit and Bean loved walking around and playing in the water. 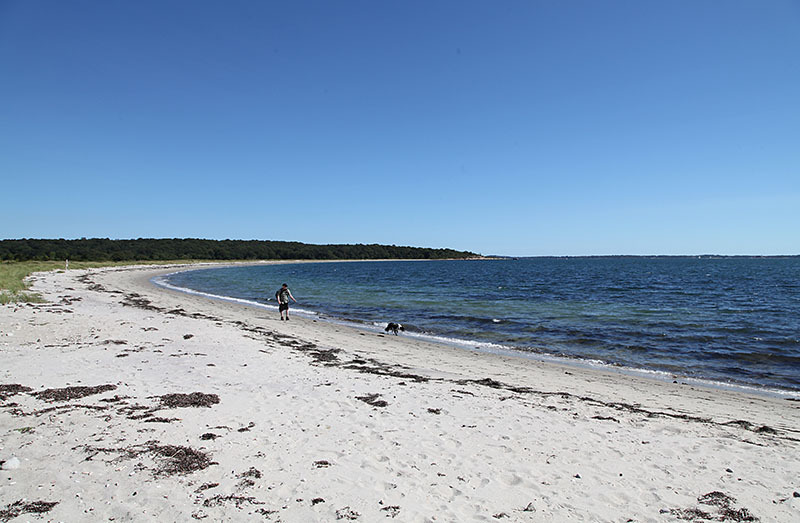 The beach looks out into the harbor and the surrounding islands. A nice place and maybe at high tide it would be better. It does have a nice boat launch to the side, so we will definitely come back to paddle. On the way in, I spotted a thrift store, so I had Bill stop on the way out. It was a small shop but always fun to see what they have. I found out it was fill a bag day, so for five dollars I could take what I could fill a bag with. 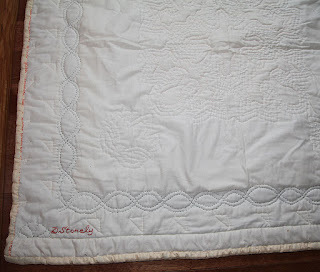 I had found a quilt and I couldn't leave it sitting there, it is hand quilted and she signed her name with stitching. 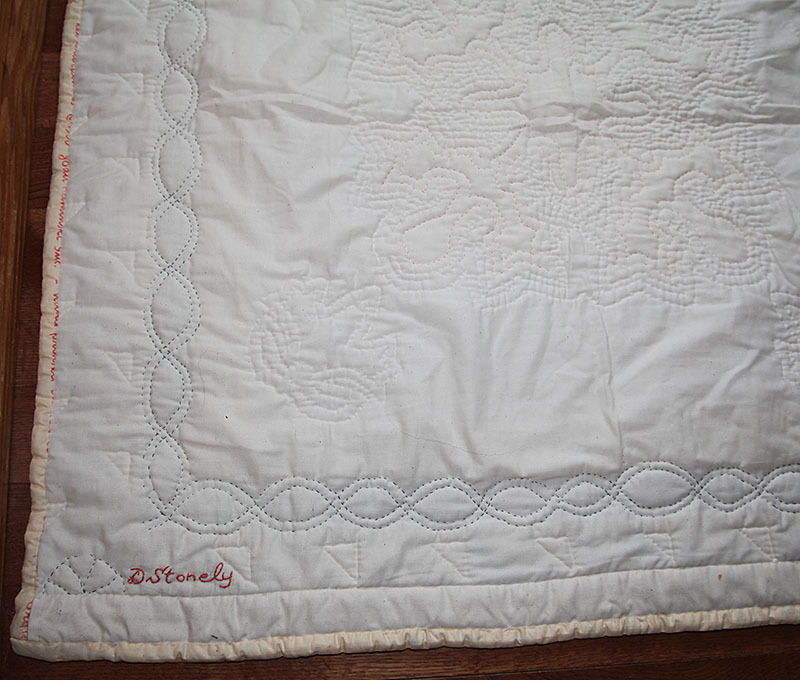 On the edge I could see the date, 1980 for the border fabric and it looks brand new. Not perfect stitching, but you can tell she put a lot of love into it. There wasn't a lot to pick from, but I found a beautiful shirt type dress and a tank that I can use for sleepwear, both look new. To end the day we went to Burlingame boat launch. 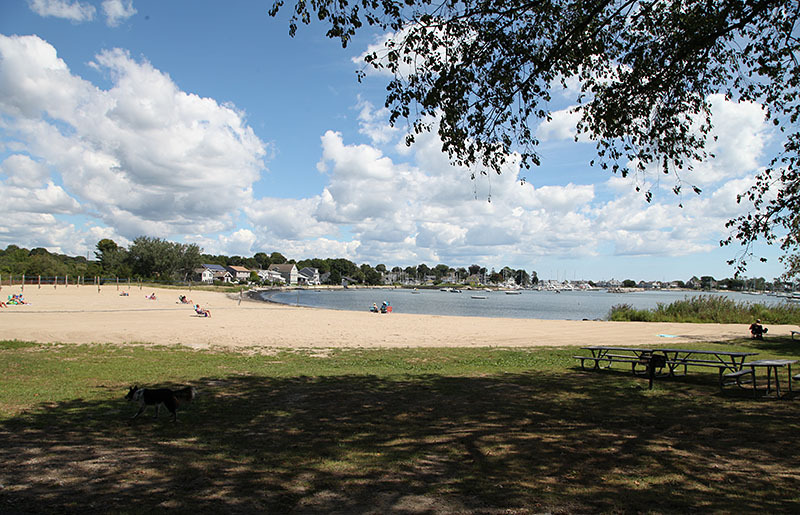 It is a launch but has a stretch of beach and the waters are shallow. 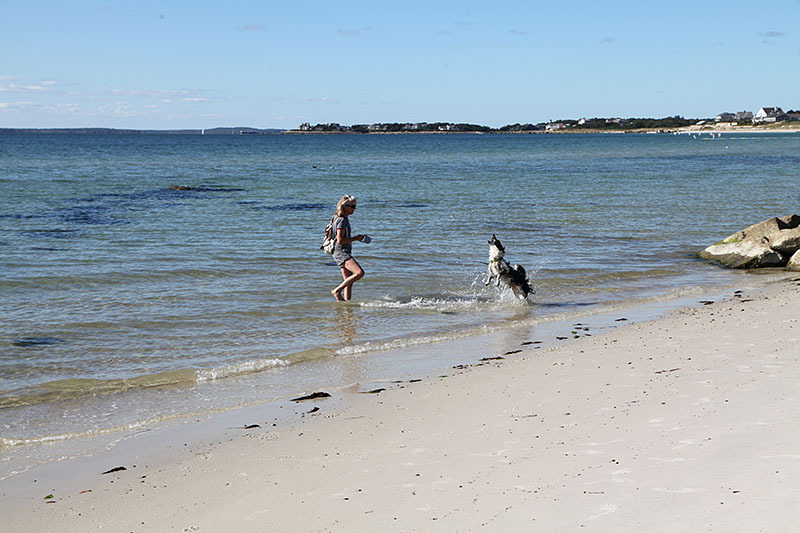 We swam a bit and Bean was having a ball playing in the water. 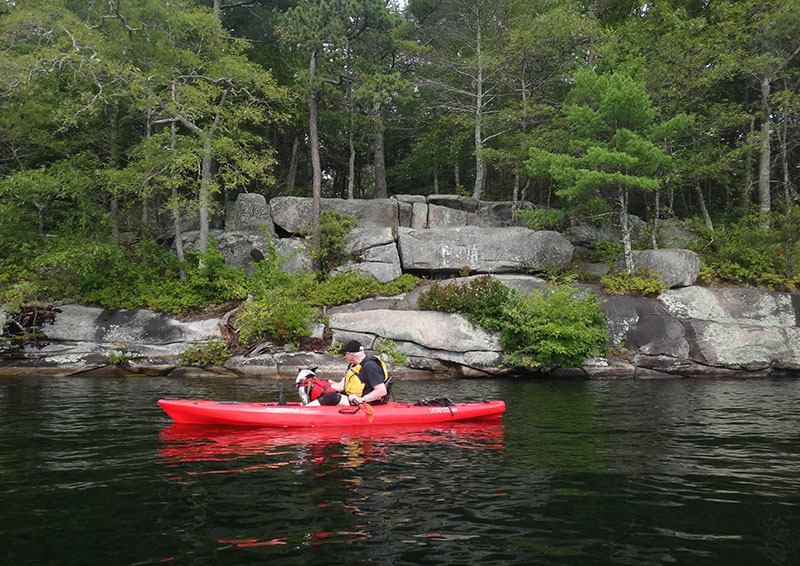 I also took a short paddle to the cove and back, and I am finding that it does hurt my back so not sure if I can do a long paddle yet. 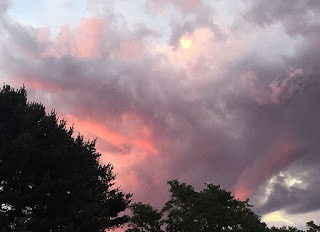 To end the day, we had a beautiful sky as the sun went below the horizon. I wanted to get a photo and when I put it in the computer, I noticed something in the sky that I hadn't seen, when taking the photo. A little bit of love from Heaven. The perfect way to end my day.